From the archives: IB World magazine regularly highlights graduates of the IB Diploma Programme. 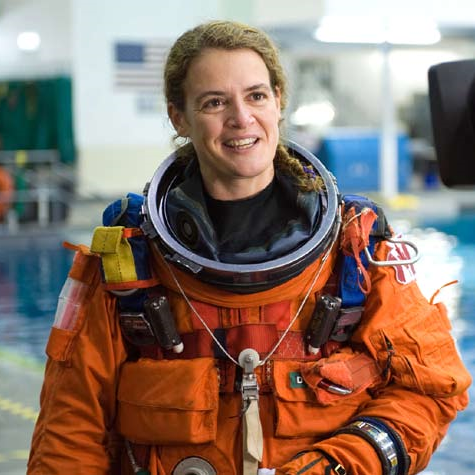 Julie Payette, United World College (UWC) of the Atlantic in Wales, UK, was featured in the January 2010 issue. When Julie Payette talks about the importance of preserving our planet, her words carry a unique credibility. Very few people have ever seen the Earth from space, and on her most recent mission, the 46-year-old Canadian astronaut had plenty of time to reflect during “blissful moments” gazing at the planet from above. “Seeing the Earth like that makes you appreciate it and want to take care of it,” she says. “It reinforces the fact that there is only one planet.We all share it and it isn’t self- sustaining.We have to work at it.” Almost every child has dreamed of being an astronaut. For Julie, the road into space was arduous, and most of her day-to-day role with the Canadian Space Agency (CSA) is far removed from the few precious weeks she has spent outside Earth’s orbit. She knew she wanted to visit space at the age of nine but, she says, “it didn’t make any sense… I grew up watching the Apollo 13 astronauts go to the Moon and I wanted to do that so badly. The first IB graduate in space is back on terra firma with some breathtaking souvenirs. Just don’t ask her about little green men. Julie left her native Canada at 16 to study the IB Diploma Programme at the United World College (UWC) of the Atlantic in Wales, UK (she credits the Diploma Programme with teaching her to be organized), then graduated in engineering at McGill University in Montreal. As an engineer, she worked for IBM in Canada and Switzerland, and at the University of Toronto, before being picked as one of four astronauts from 5,300 applicants by the CSA in 1992. Being an astronaut mostly entails supporting existing missions from the ground, training, testing and taking part in research. But in 1999, Julie’s dream was realized when she flew in the Space Shuttle Discovery to the International Space Station (ISS), around 220 miles from Earth, on a two-week mission supervising space walks where essential repairs were conducted. Ten years on, in July 2009, she returned to the ISS aboard the Space Shuttle Endeavour (pictured below). This time, she was chief engineer when a crew of seven international astronauts fitted a new platform to the station’s laboratory, to enable advanced experiments to be conducted. This story originally appeared in the January 2010 issue of IB World magazine. Are you an IB graduate? Join the IB Alumni Network by visiting www.ibo.org/alumni and connect with us on LinkedIn, Twitter and Instagram.